It seems that naming has been an issue that has plagued my entire career. Confusing names. Names that sound similar but mean very different things. I'm even guilty of causing it! But if you take one thing away from this blog post: Couchbase is not CouchDB. They are both database products, with some common roots, but they are not the same thing. Damien Katz on why he moved on from CouchDB to Couchbase. A comparison of Couchbase and CouchDB. I used single letter variables. For no good reason. It didn't occur to me that I could use an entire word! For my undergrad. I went to Ohio University. No, not the Buckeyes of Columbus. The Bobcats of Athens. Oh, but I also went to The Ohio State University for my master's. Those are the Buckeyes of Columbus. I moved to Student Affairs IT. Student Affairs was renamed to Student Life. I have no idea what it's called now. I still call it Student Life. My wife and I named our firstborn "Matthew Kevin Groves". He's not Matthew Groves Jr, because my middle name isn't Kevin. The convention within my family is that I am "Matt" and he is "Matthew". "Groves", "Grover", "Tall Guy" also work. If you call me "Tall Guy", be prepared to be called "Shorty" or "Shrimp". I will NOT tolerate any use of "Matty". I'm not "Grooves" or "Graves" or "Grove". I live in Grove City, Ohio. I realize this doesn't help. I used to live in an apartment complex called "The Groves", which is in Grove City. I may be related to Leslie Groves. This has nothing to do with naming, it's just a cool bit of trivia I thought I would mention. I worked at Quick Solutions in Columbus for a bit. Quick Solutions was named after a guy with a last name of Quick. Neat, huh? It's not called Quick Solutions anymore; It's Fusion Alliance now. I worked for Telligent for a few years. It's a company based in Dallas which makes the excellent Telligent Community product. They changed their name to Zimbra while I was working there (after an acquisition). After I left, they changed their name back to Telligent (after some sort of spin-off). The people I knew and worked with are with Telligent. Telligent and Telerik are different companies; I've never worked for Telerik. Jim Holmes worked for both Telligent and Telerik. Thanks for that, Jim. If it helps, think of "SQL Server" and "MySQL". They both have "SQL" in the name, but they aren't the same thing. Couch is an acronym (Cluster Of Unreliable Commodity Hardware). Well, that's it. I started this post just to help and clear up the "CouchDB" and "Couchbase" thing, but it turned into more of a personal rant. Anyway. Couchbase. My new employer is Heuristic Solutions, and I am starting as the Software Solutions Lead today. (I blurred the phone numbers and email address to avoid spam, but if you want to know what they are, just contact me). Heuristic Solutions made me an offer that was just too good to turn down. We are a very small consulting firm, but also a product company. 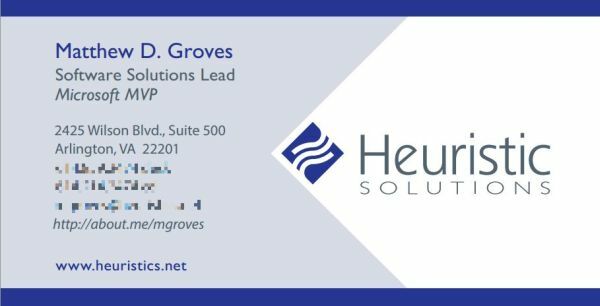 Heuristic Solutions is the company behind Learning Builder, a leading online credentialing management platform. However, I won't be on the product team. Instead, I'm coming on to help grow the consulting practice. In my view, a consultant company that also builds and sells a product (or a product company that also has a consulting practice, depending on how you look at it) is in a very strong position. I won't go into it too much, but imagine the talent that you can develop and attract when you can offer experience in a variety of technologies and industries, and then apply that experienced talent to your own product. And, more practically, think about the diversification of revenue sources. Anyway, the opportunity to lead the consulting practice for a company positioned like Heuristic is positioned is just something that I couldn't say no to. I'll still be working remotely (though probably travelling a bit more than I was with Zimbra). Just like when I started with Telligent, I'm a little scared! I have some pretty ambitious goals for myself and for Heuristic, and I've left one of the best jobs of my career to take on a whole bunch of new responsibilities and risks. However, it's a challenge that I think I'm ready for. I'll be a coworker with the inimitable Seth Petry-Johnson (though he's on the product side), and after extensive talks with founder Christopher Butcher, I'm very happy about the Heuristic philosophy and the direction that he wants to take Heuristic. Over three years ago in August 2010, my life changed drastically. I was working as a consultant for a consultant company that I like (and still like), with team members that I like (and still like), but for a project and client that I haaaaaaaated. I was miserable, and even my wife could tell. Though some good things eventually came out of my experience on that project, I couldn't wait to move on to a new client. However, that time never came. Jim Holmes tweeted that his employer (at the time) was hiring a developer for a remote work position. I had some reservations at the time about working from home, but I figured...why not? I'll try something that really scares me. After a rigorous interview process with Jayme Davis, Josh Ledgard, and many others (Did I mention Rob Howard, founding member of Microsoft's original ASP.NET team? ), they let me become part of the Telligent Analytics product development team. Yes, Telligent. TELLIGENT. Not Telerik. Telerik is a different software company that makes very different products. Jim Holmes worked for Telligent then, but he works for Telerik now (belay that, he just left Telerik and is moving on to something else). Yes, I realize that makes it more confusing. The twin frontiers of working from home and working on a product team were very challenging. Keeping up with a team of really sharp developers like Scott Watermasysk, Kevin Cunningham, Jose Lema, and others was difficult, but rewarding. I learned a lot, and I helped to ship some products. I got to work with Jim Holmes(! ), and a great QA team including Miles Dunn. I annoyed Michael Monteleone, Wyatt Preul, and Ben Tiedt on a regular basis. I could list a dozen more awesome employees of Telligent (past and present) that I got to work with. I also had a major life event while working from home: two broken shoulders caused by a major seizure. Telligent was incredibly accomodating, and if I weren't already working from home, my life could have been affected a whole lot worse. Telligent eventually merged with (purchased) Zimbra from VMWare, and took their name. This opened up a whole lot of amazing possibilities with email, database technologies, integration, and analytics. I got the opportunity to present a session at The Big Social, which is the annual Telligent/Zimbra conference. I helped to ship a major new release of the Analytics product--version 4.0, which was rebuilt entirely to take advantage of the Zimbra Community platform. I got to work on a code base where I had plenty of input on design decisions, and I got to work with support helping customers on a regular basis. I could absolutely see myself retiring as a Zimbra employee. Everyone I've worked with at Zimbra has been sharp, kind, professional, and if you are reading this blog post now wondering if you should apply to work there: yes, you should. However, another opportunity presented itself that I just couldn't say no to. More on that next. No Weekly Concerns this week, but don't worry: it'll be back next friday.